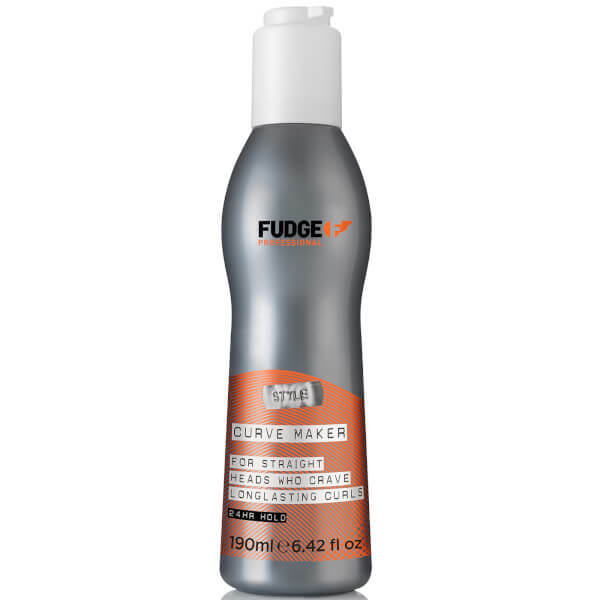 Create lasting curls with Fudge Curve Maker, an essential styling tool for stubborn straight hair. Manipulating straight hair to create bouncy curls, the curl-creating formula utilises Elasto-Curve Technology and Collagen to plump the look of hair and form lasting curls with 24 hour hold. Restructuring Hydrolyzed Keratin, Wheat and Silk Proteins provide heat protection up to 235ºC, while Amino Silicone Elastomers and Hyaluronic Acid work in synergy to produce an elasticising effect, regulate moisture and control frizz. Expect lasting, healthy-looking curls. Pump into hands and apply to towel dried hair. Apply heat to set. Use with styling tools and tongs. For fine hair, use sparingly.